I grew tired of manually moving databases around using a combination of SQL and "Copy / Paste" so wrote out a bit of PowerShell to save me some time and effort. Notice that I am using the copy-item then deleting the object, not just moving the item. This is because of how permissions on objects are handled with copy vs move, plus I am paranoid about not having my original database handy if the move fails, or the moved database gets corrupted in transit. In the first section we will be setting the variables. 01/01/2016: Fixed issues with ACL for moved files by converting file location to UTC based path format. 01/05/2016: Major update to fix $destination to UTC path, added copyItem function, item extension switch, updated outputs with write-output and write-verbose. At some point within your career of deploying SharePoint, you will hopefully come across a scenario where your SharePoint servers are not allowed internet access. Most of the server farms that I work on are not allowed access to the Internet or are fire-walled/ruled out of the ability to surf the web or the ability to download items directly. This brings me to the need to be able to download the required files to a specific location and use that location for SharePoint's PrerequisiteInstaller.exe to complete its installation. If you need to do an offline installation of SharePoint 2016, you will need to have the prerequisite files downloaded ahead of time. You will also need the SharePoint 2016 .iso (download here). These scripts are based off of the scripts provided by Craig Lussier (@craiglussier). These scripts will work for SharePoint 2016 on Windows Server 2012R2 or on Windows Server 2016. The only change that needs to be made is the location of the SharePoint prerequisiteinstaller.exe file in script #3 line #3. So, update the $sp2016Location variable before running. If the SP2016 .iso is mounted to the "D:\" drive, you have nothing to change and, in theory, this should just work for you out of the box. I hope that this saves you some time and headaches trying to get SP2016 installed and running correctly. 08/25/2015 Added verbiage on updating $sp2016Location variable, and added workaround for PowerShell bug in download script. 11/25/2015 Updated for installation of SharePoint 2016 Beta 2 bits. 11/14/2017 Updated the scripts to install SharePoint 2016 on either Server 2012R2 or Server 2016. 11/29/2017 Updated the scripts to install SharePoint 2016 on Server 2016 Standard or Datacenter. Thank you Matthew Bramer for fixing this oversight. In the past when I needed to move BLOBs between Azure Containers I would use a script that I put together based off of Michael Washam's blog post Copying VHDs (Blobs) between Storage Accounts. However with my latest project, I actually needed to move several BLOBs from the Azure Commercial Cloud to the Azure Government Cloud. Right off the bat, the first problem is that the endpoint for the Government Cloud is not the default endpoint when using PowerShell cmdlets. So after spending some time updating my script to work in Commercial or Government Azure, I was still not able to move anything. So after a bit of "this worked before, why are you not working now?" frustration, it was time for plan B.
Luckily enough the Windows Azure Storage Team had put together a command line utility called AzCopy. AzCopy is a very powerful tool as it will allow you to copy items from a machine on your local network into Azure. It will also copy items from one Azure tenant to another Azure tenant. The problem that I ran into is that the copy is synchronous, meaning that it copies one item at a time, and you cannot start another copy until the previous operation has finished. I also ran the command line in ISE vs directly in the command line, which was not as nice. In the AzCopy command line utility, a status is displayed letting you know elapsed time and when the copy has completed. In ISE, you know your BLOB is copied when script has completed running. You can read up on and download AzCopy from Getting Started with the AzCopy Command-Line Utility. 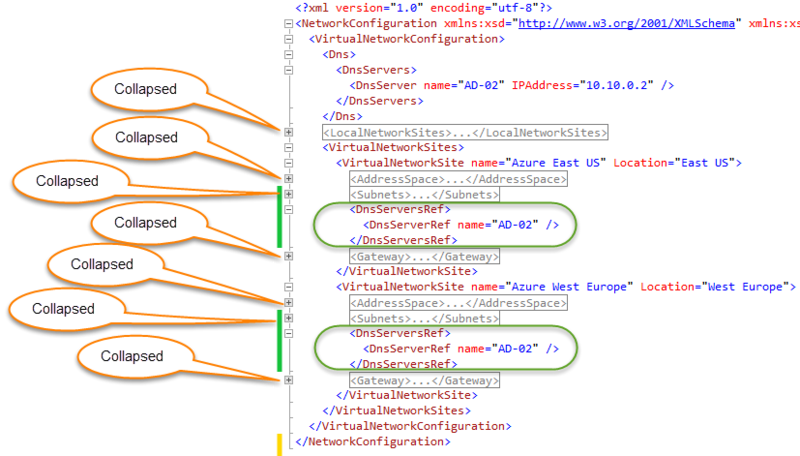 This is the script that I used to move BLOBs between the Azure Commercial Tenant and the Azure Government Tenant. $sourceKey = "insert your key here"
$destinationKey = "insert your key here"
While I was waiting for my BLOBs to copy over, I decided to look back at my Plan A,and see if I could figure out my issue(s). After cleaning up my script and taking a bit of a "Type-A personality" look at the script, I noticed that i was grabbing the Azure Container Object, but not grabbing the BLOB Object before copying the item. Once I piped the container to the BLOB before copying, it all worked as expected. Below is my script, but please notice that on the Start-AzureStorageBlobCopy cmdlet, I am using the -Force parameter to overwrite the existing destination BLOB if it exists. $srcStorageKey = "insert your key here"
$destStorageKey = "insert your key here"
Having more than one way to get something accomplished within Azure if fantastic. There is not a lot of documentation out there on how to work with Azure and PowerShell within the Government Cloud, so hopefully this will make life easier for someone. Remember that these scripts can be used across any tenant, Commercial and Government and On-Premises. 08/05/2015 Fixed cut and paste variable issues and added $destBlobName for renaming BLOBs at the destination location, and updated BLOB status check wait time. Separation of roles, duties, and responsibilities in a larger corporate/government environment is a good thing. It is a good thing unless you are actually trying to get something accomplished quickly on your own. But this is why there is a separation of roles, so that one person cannot simply go and add objects into Active Directory on a whim, or play with the F5 because they watched a video on YouTube. I recently had designed a solution that was going to take advantage of SQL Server 2012 High Availability and Disaster Recovery Always-On Group Listeners. The problem was that I was not a domain admin, and did not have rights to create a computer object for the Server OS Windows Cluster, or the SQL Group Listener. Creating the Group Listener was a bit more challenging, but not too bad. Once the OS Cluster computer object was created (thespsqlcluster.contoso.local), the newly created computer object needed to be given rights as well. - The cluster identity 'thespsqlcluster' needs Create Computer Objects permissions. By default all computer objects are created in the same container as the cluster identity 'thespsqlcluster'. - If there is an existing computer object, verify the Cluster Identity 'thespsqlcluster' has 'Full Control' permission to that computer object using the Active Directory Users and Computers tool. You will also want to make sure that the quota for computer objects for 'thespsqlcluster' has not been reached. 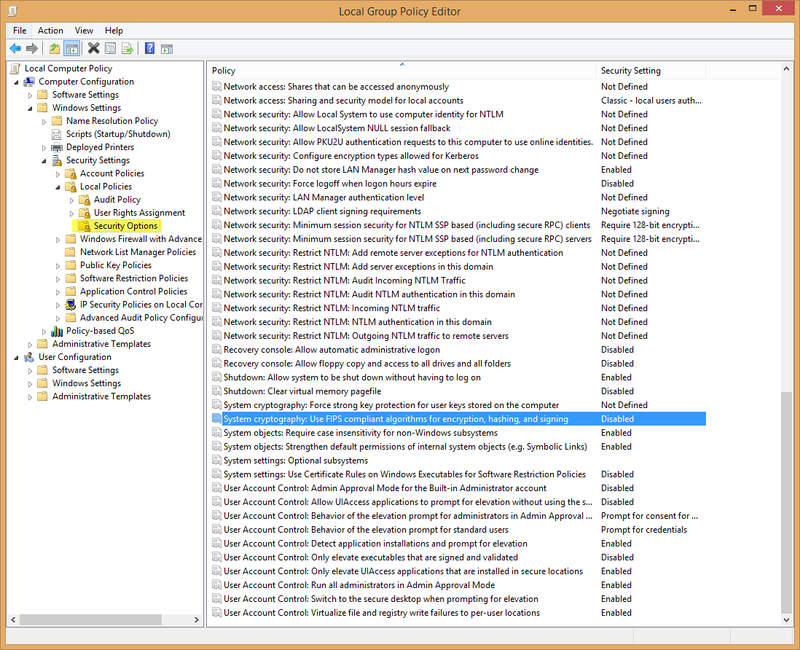 The domain administrator was also given Sysadmin rights to all of the SQL Server instances in the cluster. After the group listener is created, all the rights that were put in place can once again be removed with the understanding that if you wish to add another listener at another time, the permissions will have to be reinstated temporarily once again. In my case, once all of the computer objects were created successfully, all rights were removed off the cluster computer object and the domain administrator was removed from SQL. 07/06/2015 Cleaned up diction and grammar, added the Important section. A couple of weeks ago, I started a "Greenfield" implementation of SharePoint 2013 for a client. This organization has SharePoint 2003, 2007, 2010 already existing in their environment, so I ignorantly figured that the installation should go pretty smoothly. Disabling FIPS is easy, however a larger discussion needs to be had. Is FIPS set at the GPO level or is it part of the image that was provisioned and FIPS was enabled by default? Will the security team come after you if you disable it without their knowledge? Why do they have FIPS enabled, and what are they trying to accomplish with FIPS? All of these questions will need to be answered before changing your server settings. This is how I reset the FIPS Algorithm Policy so that I could get Central Administration provisioned. Remember that FIPS will need to be disabled on all of your SharePoint Servers. Set-ItemProperty -Path $path -Name "Enabled" -Value "0"
It is funny how some things are just easier to use a GUI to deploy versus trying to figure out a problem in code or PowerShell. That is until you run into a client that says you cannot use a GUI within their environment. With SharePoint 2013, having a single Web Application (IIS site) in IIS for Host Named Site Collections (HNSC), it is necessary to use a combination of host names and Server Name Identification (SNI) to route the incoming requests correctly. 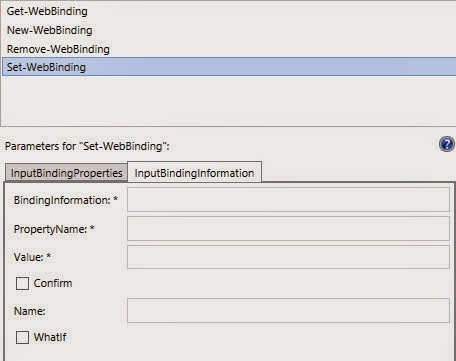 You would think that with the ability to create a New-WebBinding in PowerShell, that you would have the ability to set all of your binding properties in one cmdlet, but you would be wrong. If you run the Get-Binding cmdlet for your site, will will see that there are properties for the certificate thumbprint (certificateHash) and certificate store location. New-WebBinding -Name $site -SslFlags 1 -HostHeader $hostHeader -Protocol https -Port 443 -IPAddress "*"
Now, you are not truly done yet. Currently the site does not have a default SSL site as all of the bindings created so far all have Host Headers associated with them, which will create an error within IIS. 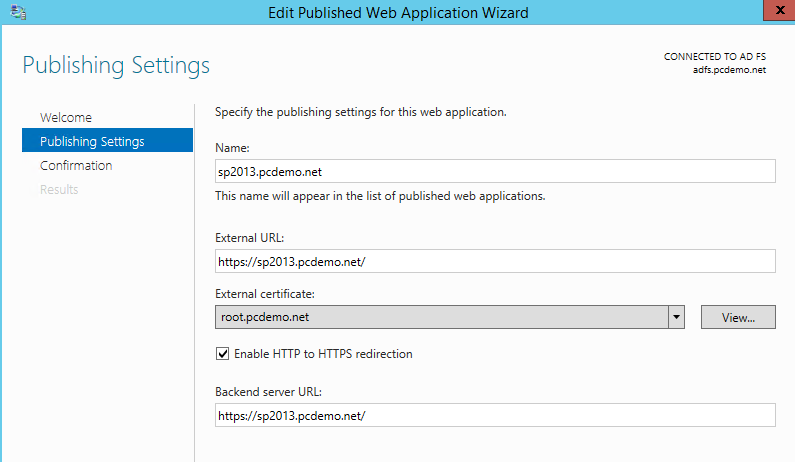 For those of you implementing SharePoint, it is now time to bind your App Domain. 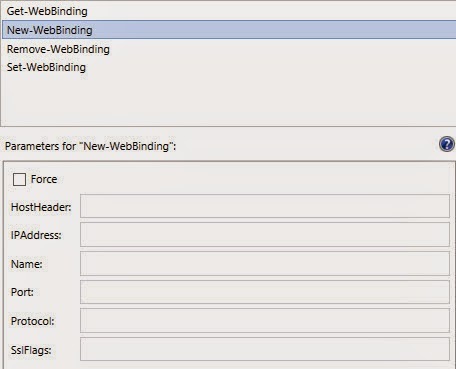 This is the binding that will accept all incoming requests that do not have an SNI associated with them. # is there already a binding? 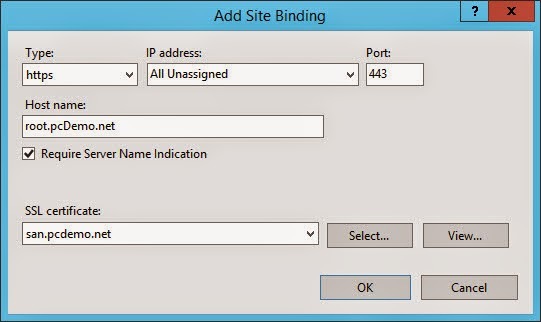 New-WebBinding -Name $site -Protocol https -Port 443 -IPAddress "*"
At this point the SharePoint Web Application (IIS site) should have all of its bindings in place. So what could possibly be left? Well, what about the Central Administration (CA) Web Application? This one will be a combination of the last two scripts because CA will require SNI. 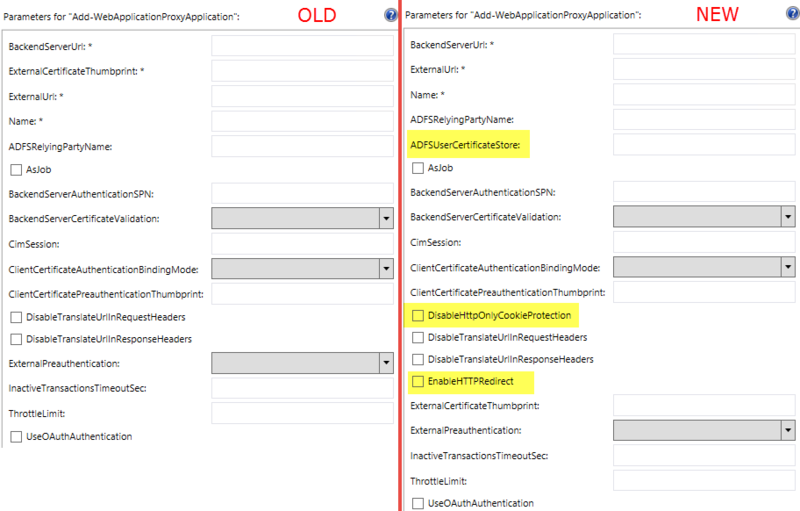 New-WebBinding -Name $site -SslFlags 1 -HostHeader $caHostHeader -Protocol https -Port 443 -IPAddress "*"
This is part 4 of the blog series on getting Started with Microsoft Azure. So what is Azure Storage? Feel free to read up on the Introduction Azure Storage site to get a good handle on Azure storage offerings. If you are not going to read about it, please know that there is a new offering called Premium Storage, which uses SSDs for low latency IOPS to support I/O intensive systems like SharePoint and SQL. You can read up more at the Azure Premium Storage site. Think of Azure Storage as a secure container with a unique namespace that holds all of your storage requirements. You can store all kinds of objects such as blobs, tables, and files. Azure is a great tool for building out servers through their GUI, however, I am not a big fan of the cryptic storage containers that Azure provides if you just create a server before creating your storage. This cryptic Name is carried down to the URL of the storage account. Now, let's say that we need to put our data on SSDs as we are running SharePoint in Azure, and we want to optimize our SQL drives. Ideally you would want to put the drives in the new Premium Storage. Unfortunately, at the time of this blog post, Azure Premium storage is only available in the West US, East US 2, and West Europe. If your Azure account is not set up correctly, you will receive notice that your "subscription is not authorized for feature Premium Storage". Just like on-premises storage for SQL, for best optimization of data transfer, you want to put your SQL storage on different LUNs. In Azure, you have the ability to break out your disk storage into different LUNs as well. Now, depending on the type of VM tier series that you are using (A0 Standard) will determine the number of drives that you can have attached to your VM. So while architecting your Azure infrastructure/machine, make sure the VMs that you want to use, support the number of disks required. I suggest reading through Virtual Machine and Cloud Service Sizes for Azure before building out your VMs. Remember that in a Virtual Environment the disk associated to a specific VM is just another .vhd file that does not have an OS installed/assigned to it. So to add a disk to a SQL Server, it is easier to add the data disk after the VM has already been created. We will go through creating the data disk in Part 6: PowerShell for Azure- Creating Virtual Machines. 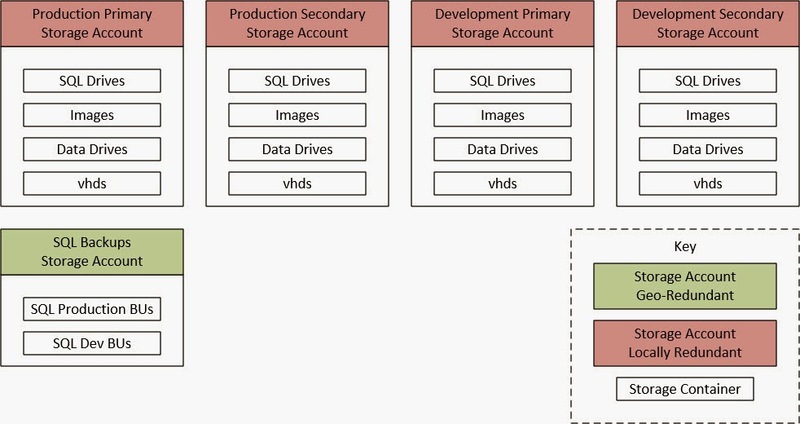 If you take a look at the image of the locally redundant storage, you will notice that there are containers called "vhds". The PowerShell script does not create these containers since Azure will create the containers as needed when the Virtual Machines are created. Managing your storage is very important when it comes to optimizing your IOPS and system latency. It is also very nice was to make sure that you keep your naming schema nice and clean, and using PowerShell to create your storage also helps keep everything user friendly. Now that the storage infrastructure is in-place, it is time to upload a .vhd into the Images folder. Please see my next post on Uploading VHDs. 03/31/2015 Added the Warning section about the potential for Storage Account corruption. This is part 3 of the blog series on getting Started with Microsoft Azure. At this point we have our Azure Tenant created, and the subscription named appropriately. We also have an idea of what data centers will be hosting Contoyso's data. If you have not looked at the first blog post, this is where we are for our data hosting. To say that Microsoft's data centers are huge, is an understatement, as the data centers are built to host, essentially, shipping containers of racked storage of servers and hardware. The biggest problem moving forward, just like any on-premises data center, is how to minimize latency between servers. To keep servers as close together to reduce latency and increase performance, Azure uses a feature called Affinity Groups. Affinity Groups aggregates the compute and storage services not just to the same data center, but into the same server cluster and was assigned to specific physical pieces of hardware. In the beginning, you had to tie your network to an Affinity Group, but this has caused problems within Microsoft, as the Affinity Groups were tied to hardware, and when the hardware needed to be replaced, issues arose. So, Affinity Groups are no longer required to be tied to networks. You can still associate them, but we will not be going over that in this blog post. Also, if you have an existing Affinity Group associated with a network, it will eventually be migrated to a Regional vNET. For more information read About Regional VNets and Affinity Groups for Virtual Network. Your network administrator should be able to give this to you, or if you wish, just Bing it... "What is my ip address" to get your external gateway address. If this is a demo environment and you do not have a fixed IP, this could be a problem because you could drop your Server to Server (S2S) VPN tunnel when you glean a new IP from your provider. If this happens, all you would need to do is update Azure with your new IP address and reconnect... If this is for your production environment and you have a dynamic IP address, you should really get a static IP. Now is a good time to bring back out Excel and continue with the documentation of the on-premises and Azure infrastructure. The first thing that needs to be accomplished is creating the Local Networks. 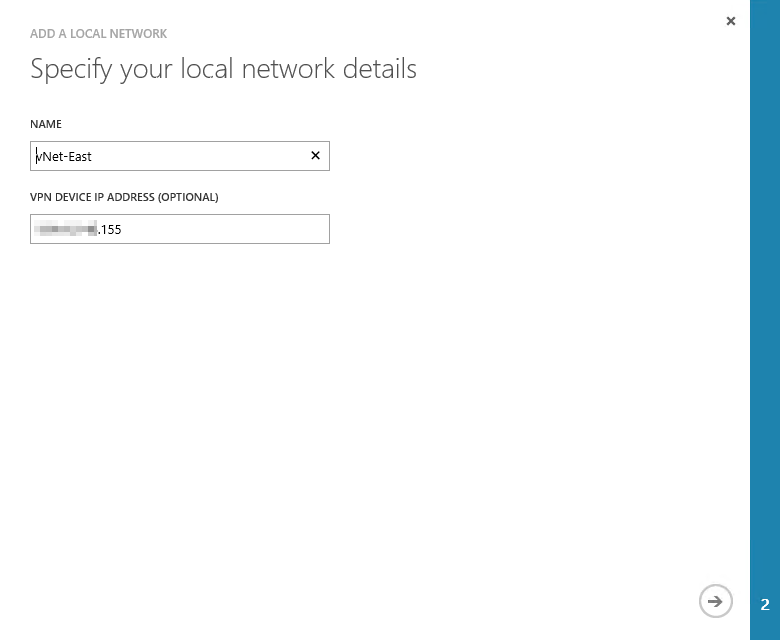 From the left hand navigation, select NETWORKS, and then select LOCAL NETWORKS from the top navigation. Once you are on the LocalNetworks page, click ADD A LOCAL NETWORK. This will open a modal window to fill out. Hopefully you have already filled out your table and have all of the required information handy. 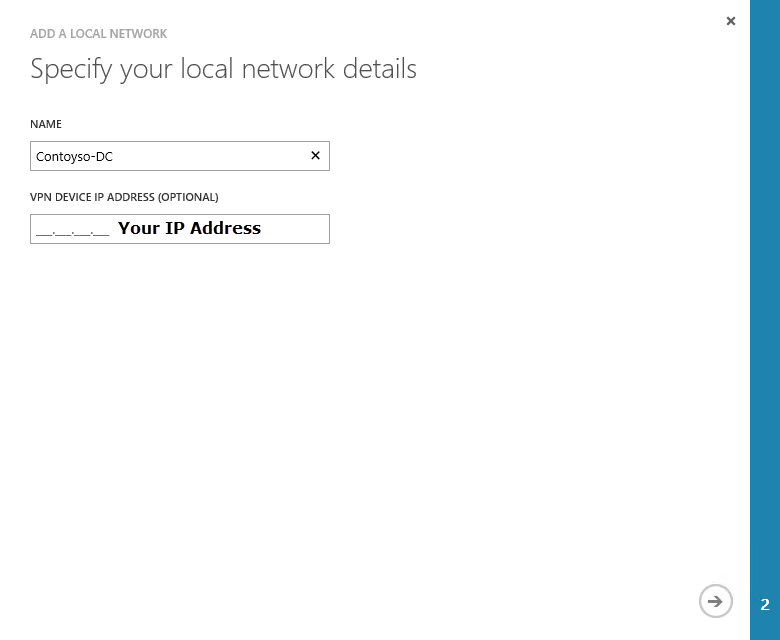 For you first network, enter you on-premises information, with the VPN Device IP being your IP Address for your corporate gateway. 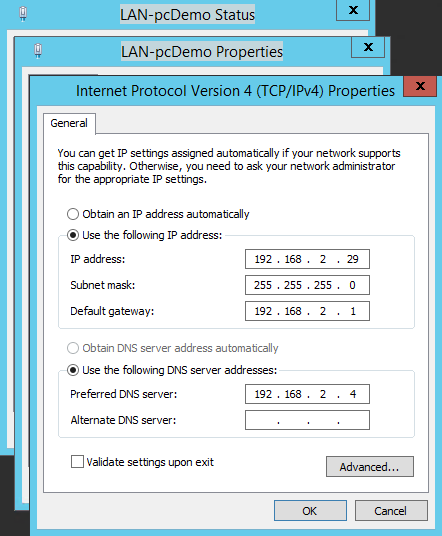 On the next page, enter your IP Address and CIDR information, and click the check to continue. 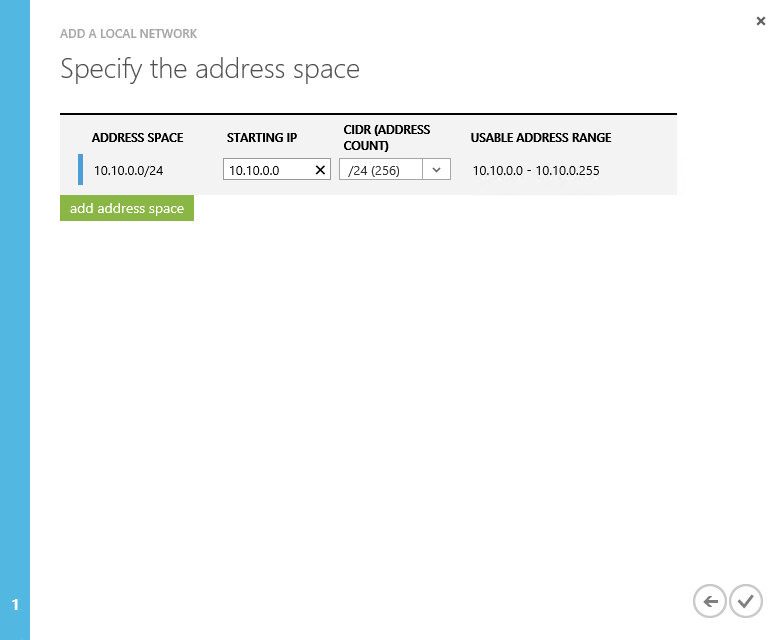 To add the next local network, click the NEW button at the bottom of the page and select ADD LOCAL NETWORK. At this point, the virtual network IP ranges have been created, but not all the IP Addresses have been added to the VPN Gateway Addresses for East US and West Europe. 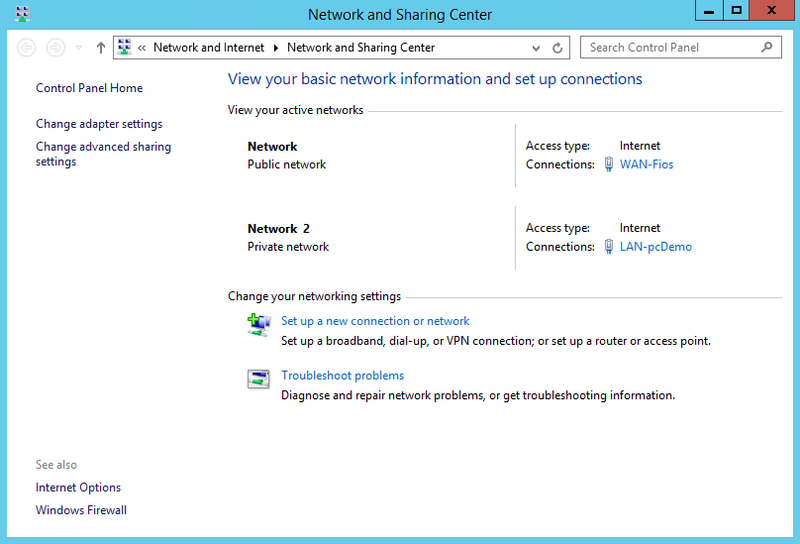 Before we can add our VPN Gateway information, the virtual networks will need to be created. The gateways IP addresses will be assigned with the creation of the virtual network. 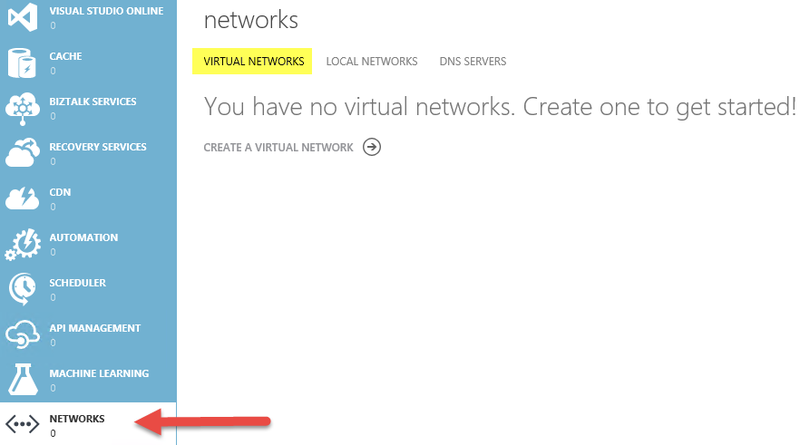 You can read Microsoft's marketing about virtual networks by going to http://azure.microsoft.com/en-us/services/virtual-network/. But essentially, an Azure Virtual Network is the infrastructure to build out your cloud network environment within or to expand your on-premises network upon. It is your Infrastructure-as-a-Service (IaaS) and Platform-as-a-Service (PaaS) all rolled into one. 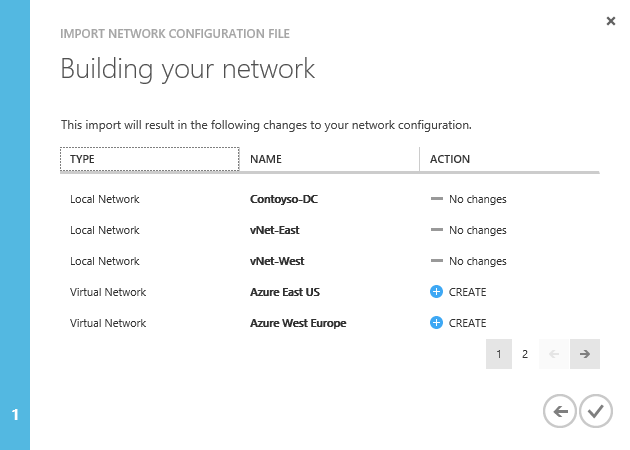 After creating the Local Networks within your Azure Tenant, it is time to create the Virtual Networks. 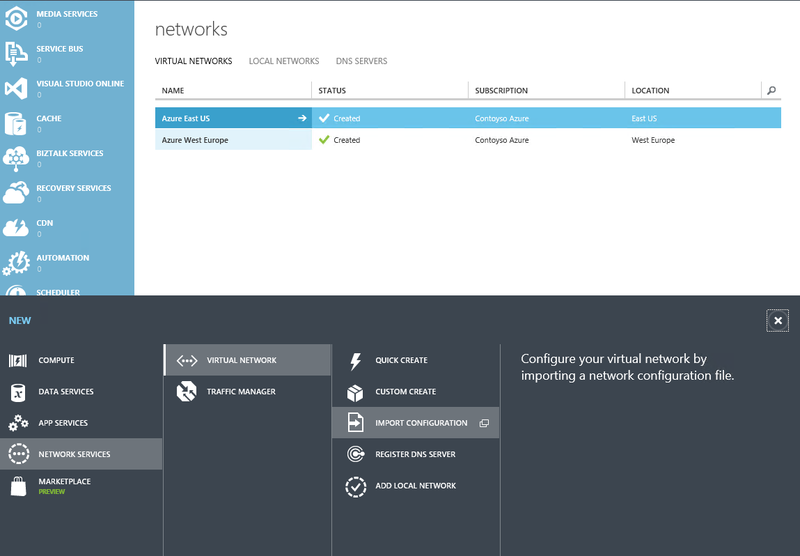 Virtual networks are the networks within the Azure Data Centers. Since the on-premises network is already up and running, only networks that need to be created at this point are the East US and West Europe virtual networks. To get started, select the NETWORKS link in the left navigation followed by the VIRTUAL NETWORKS link in the upper navigation. This brings you to the virtualnetworks page. Click on the CREATE A VIRTUAL NETWORK link to get started. This will open up a modal window, and fill out the information appropriately (look at the table you created earlier). 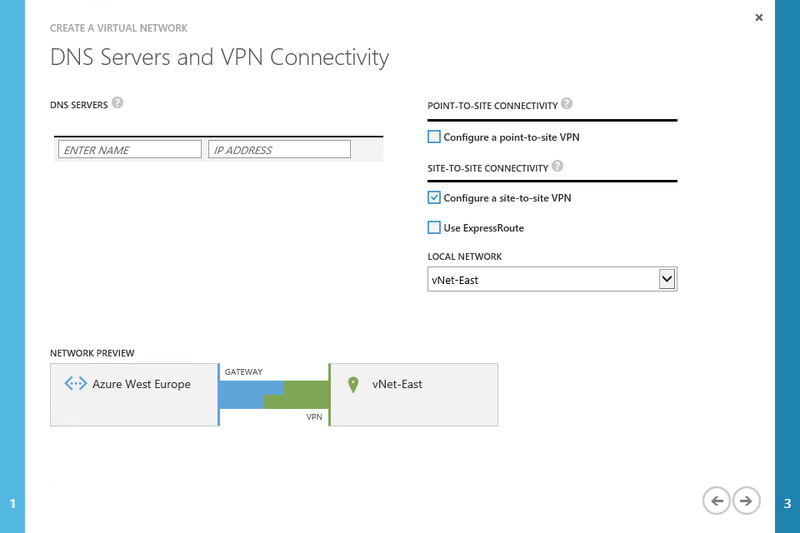 On the second page, select the Configure site-to-site VPN and select the on-premises local network. 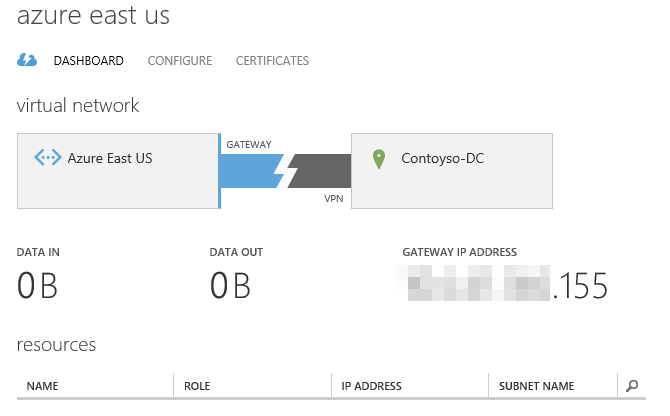 Since Contoyso is planning on extending the network into the cloud, Azure will need to know about the local DNS servers. In Azure, DNS entries are set in a priority ranking, not in a round-robin. The first entry is the first DNS server queried, so plan appropriately. Later on we will be adding the DNS server information via the NetworkConfig.xml file as well. 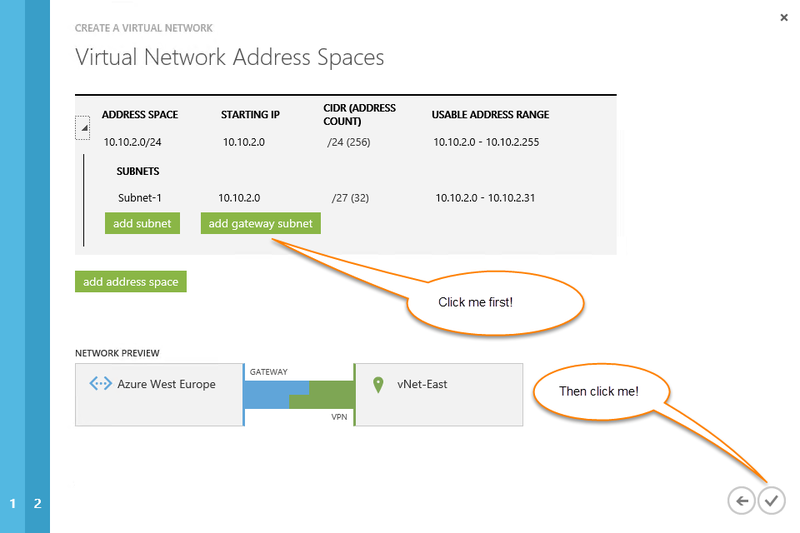 On the third page, click the add gateway subnet button. Click the check mark to finish. At this point, we need to create our gateway and get the IP address before we create any of our other networks. 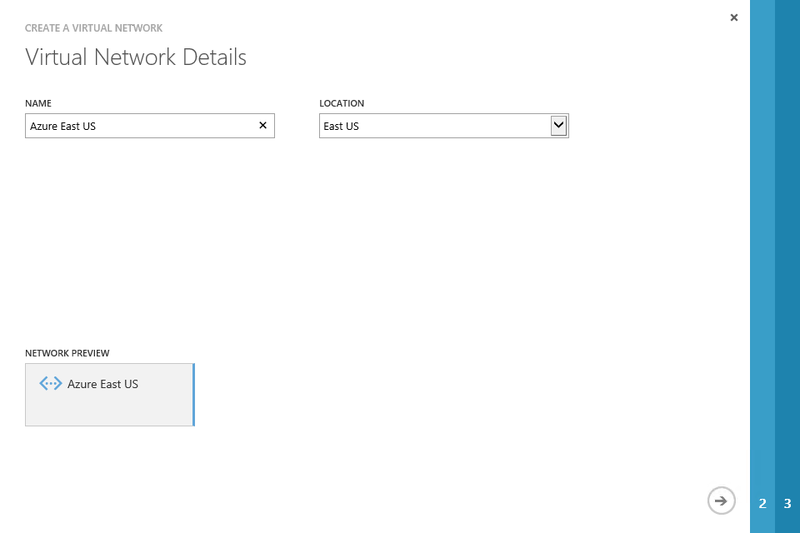 To do this, click on the appropriate network, in this case the Azure East US network, and select DASHBOARD from the top navigation. At this point, since a gateway has not been created, click the CREATE GATEWAY button at the bottom of the page. 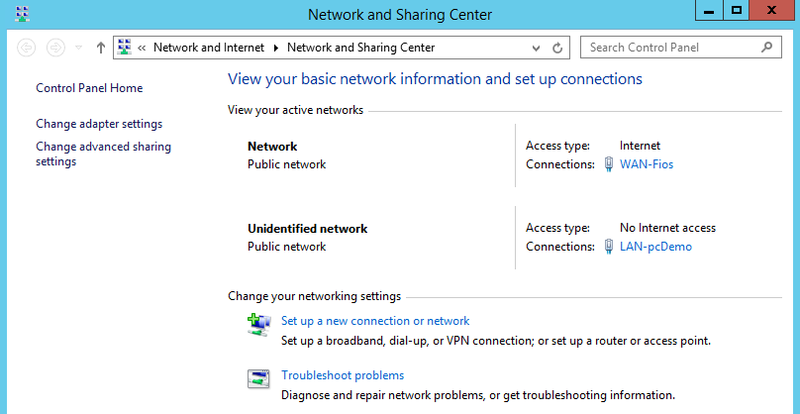 This will bring up the option for either Dynamic or Static Routing... Select Dynamic routing as static routing is not supported for the Site-to-Site (S2S) VPN tunnel that is about to be created. 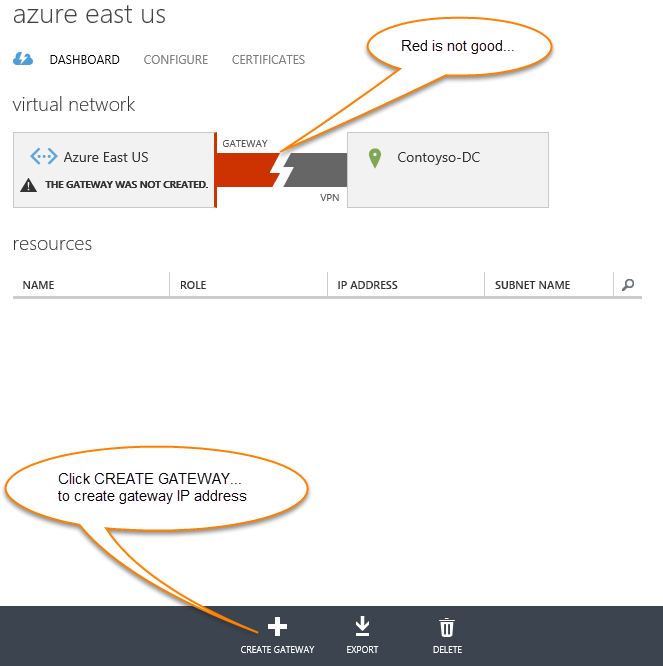 Select Yes to create the gateway... You will notice that the gateway is now yellow, as it is now (being) created within Azure. The gateway will turn green when the S2S tunnel is not broken. Gateway creation takes a fair amount of time to create, so go make a pot of coffee and come back in about 30 minutes. When the gateway has been created, add the gateway IP address to the Excel file. After the gateway has been created, go ahead and click the CONNECT button at the bottom of the page. 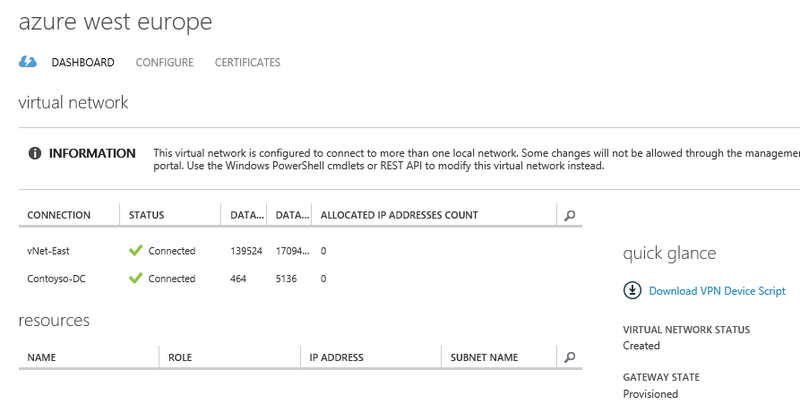 At this point, we have not created the RRAS connection on-premises so nothing will connect, but the connection has been activated within Azure for the time we get RRAS up and running. The final step is to add the IP address to the vNet-East settings on the localNetworks page, by clicking on LOCAL NETWORKS in the top navigation, selecting the vNet-East network, and clicking the EDIT button. On the second page, click the check to finish adding the IP address. It is now time to create the second virtual network. 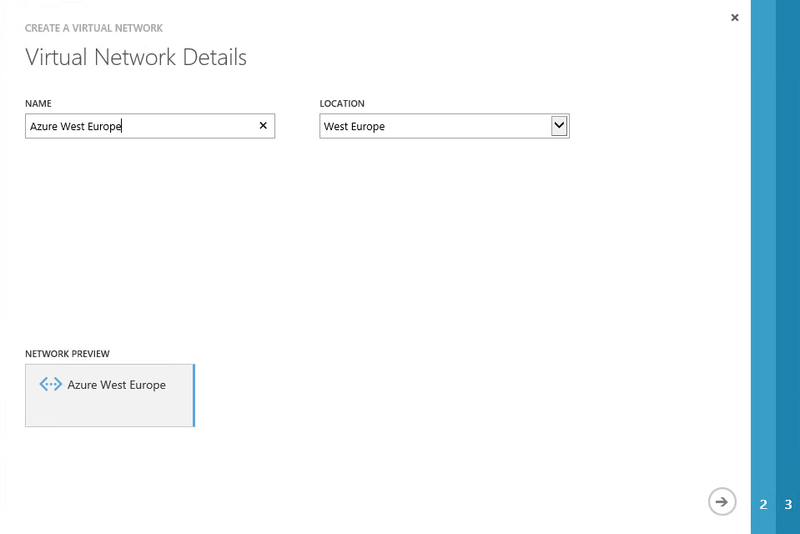 From the virtualNetworks page, click NEW to start the process of creating the second virtual network (West Europe). 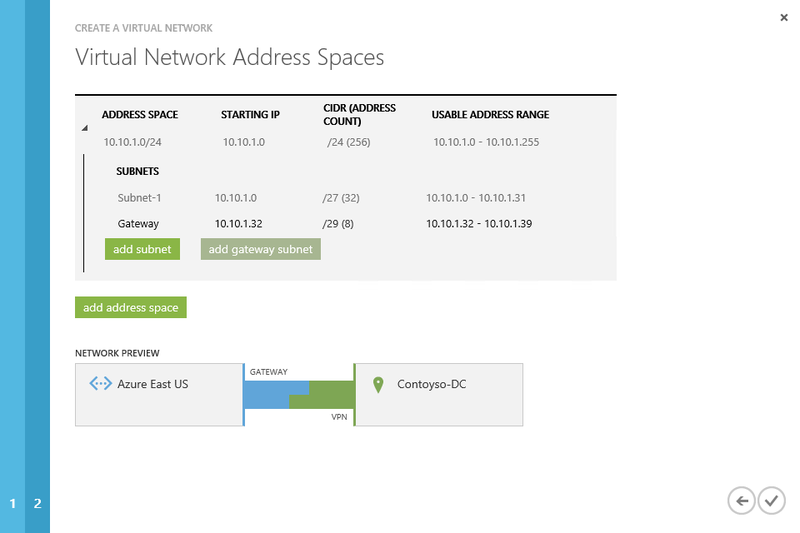 On the first page, add the appropriate name from your Excel table, and appropriate location of the virtual network. The final page will require you to create a gateway subnet, by clicking the add gateway subnet button before you finish creating your new virtual network. And, just as before, it is time to create the gateway and enable the connection. 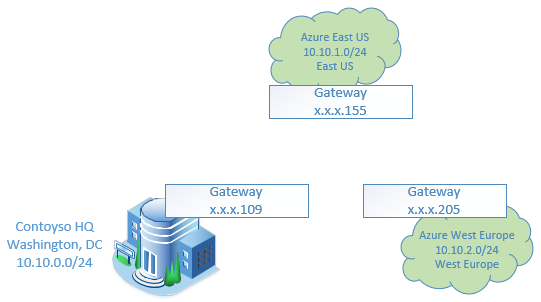 Grab the gateway IP address and add it to your Excel Table. Your Excel table should now be complete. 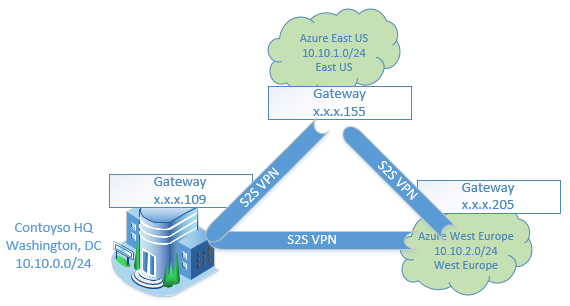 Now that all the gateway addresses have been created, update the LOCAL NETWORK VPN Gateway Addresses. Click on the LOCAL NETWORKS link at the top of the Networks page. Select the East Network and click EDIT to add the East Network's Gateway Address. Now, this is where things get a bit not so fun. At this time, it is only possible to create one connection per gateway endpoint through the Azure GUI. So to get around the limitation, we will export a copy of the network as an XML file, modify it, and upload the modified file back into Azure to complete all of our network connections. To start, go to the NETWORKS page and at the bottom of the page, click the EXPORT link. This will open a modal window that will ask for the subscription you wish to export (see my blog post: Microsoft Azure- Getting Started to create a friendly subscription name). Once you click the check box to continue, a download dialog box will open. Save the NetworkConfig.xml document someplace handy then make a copy of it... just in case you blow up your network. You can also download the file via PowerShell. Remember what networks connect to what? The East network connects to DC and West networks, while the West network connects to DC and East networks. At this point we are going to crack open Visual Studio. Remember that we installed it in the last blog post, along with the Azure module for PowerShell. We reviewed the procedures to get both applications in the previous blog post, PowerShell for Microsoft Azure- Getting Started. 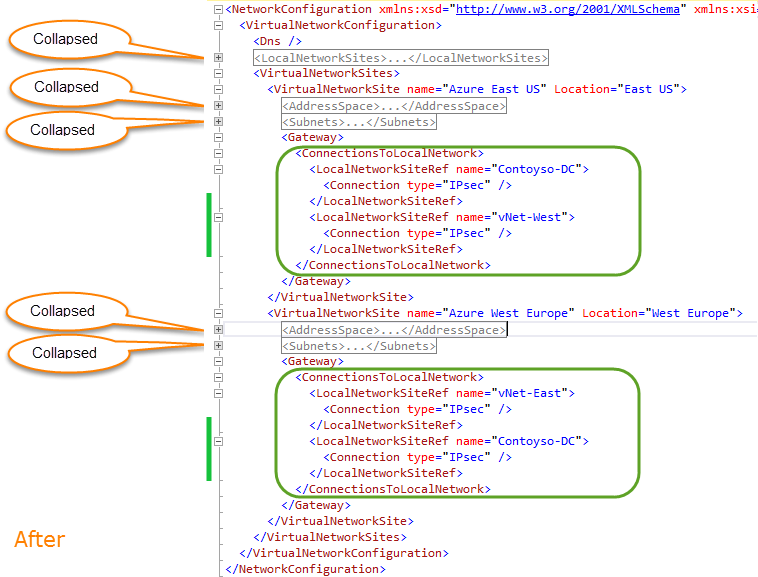 Open the the NetworkConfig.xml in your favorite XML editor or Visual Studio. 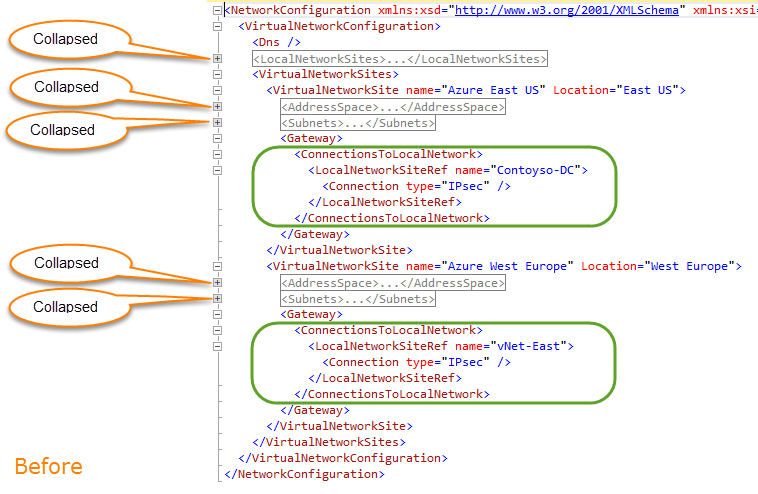 Within the VirtualNetworkSites schema, we are interested in modifying the ConnectionsToLocalNetwork sections by adding the appropriate reference to the LocalNetworkSiteRef. At this point, it is time to add the other Local Network to the gateway... Making sure that East connects to West and DC while West connects to East and DC. While you have the XML file open, let's look at the DNS entries as well. 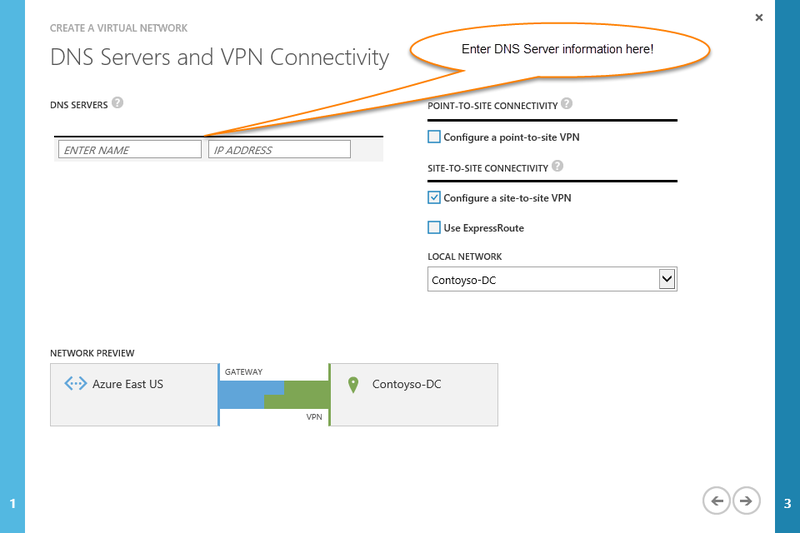 As discusses earlier, that if you wish to have the Azure servers know about the on-premises servers, Azure will need to know about your on-premises DNS. 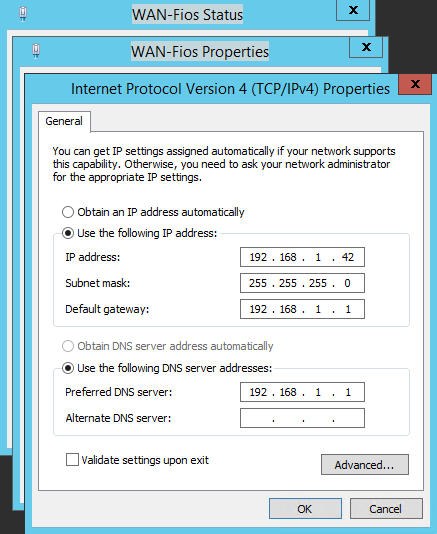 First, look for the DNS server(s), and them make sure the the server names and IP addresses are correct. At the top of the XML file, you can see that AD-02 (DNS server) is available within the VirtualNetworkConfiguration. Next, make sure that the DNS server(s) reference is associated with each network. For example, make sure that each virtual network has the AD-02 reference. If at a later time, you need to add more or edit the DNS servers, you will need to modify the XML. Make sure you save your file, before you try import it back into Azure. and import your NetworkConfig.xml file. 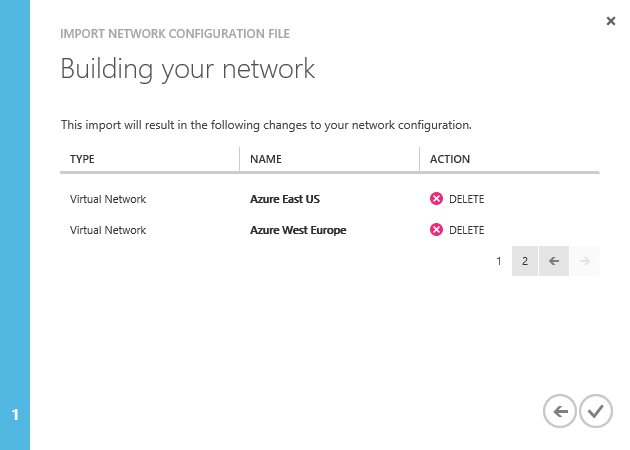 On the next page, Azure will show you the changes that will be happening to your network so that you can validate the changes. This page shows what is to be created after the original networks get deleted. Above, are the original networks that need to be deleted, before the networks can be recreated. After the new networks have been created, click into the Dashboard page of one of the Networks and see that Gateway connections are still disconnected. This is because the Gateways have private keys, and the keys need to be exchanged to start the connections. To set the keys, you need to open PowerShell and log-in to your tenant. If you do not know how to use PowerShell with Azure, please review my previous blog post PowerShell for Microsoft Azure- Getting Started. We will need to create two sets of matching keys for the East and West Virtual Networks to the appropriate local network gateways. 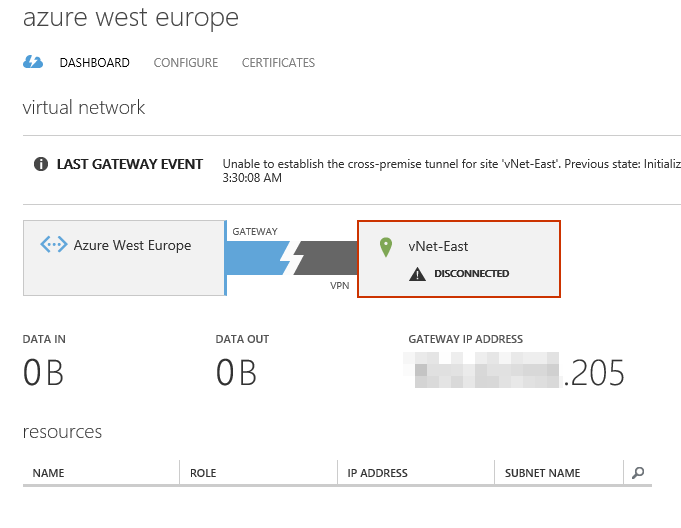 $virtualNetworkEast = "Azure East US"
$virtualNetworkWest = "Azure West Europe"
Set-AzureVNetGatewayKey -VNetName  $virtualNetworkEast -LocalNetworkSiteName $localNetworkWest -SharedKey "lxJeyvLdcgPutInYourOwnKeys1Aaksw1SplbnyK7YH"
Set-AzureVNetGatewayKey -VNetName $virtualNetworkEast -LocalNetworkSiteName $localNetworkOnPrem -SharedKey "lxJeyvLdcgPutInYourOwnKeys1Aaksw1SplbnyK7YH"
Set-AzureVNetGatewayKey -VNetName $virtualNetworkWest -LocalNetworkSiteName $localNetworkEast  -SharedKey "lxJeyvLdcgPutInYourOwnKeys1Aaksw1SplbnyK7YH"
Set-AzureVNetGatewayKey -VNetName $virtualNetworkWest -LocalNetworkSiteName $localNetworkOnPrem -SharedKey "lxJeyvLdcgPutInYourOwnKeys1Aaksw1SplbnyK7YH"
After a couple of minutes your Azure East and West local networks will have connected. Now the final, and probably the easiest, thing to accomplish is to get the tunnel established from on-premises to your East and West Gateways. Luckily for us, Azure has made that very simple for us. 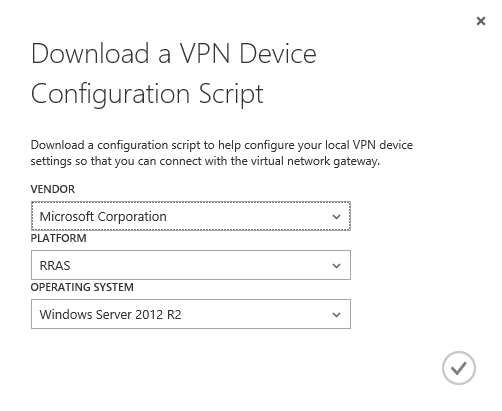 If you go to the Dashboard of your East Network, on the right hand side is a link labeled Download VPN Device Script. When you click the Download link, a modal window will pop up to select the correct type of configuration script that will need to be run on-premises. For this post we will be using Microsoft's RRAS on Server 2012R2. If you run the file as is, the required roles and features will automatically be installed. The only thing that I am not happy about with this script is that the RRAS connection name uses the IP address, not the Network name for identification. So at this point, we will modify the script to make the connection name match the Network Name. At the bottom of line 70, is the section to install the S2S VPN connection. Within this section of code, we will be replacing the name of your gateway IP address with the name of Network. Do not do a find and replace all, as we still need the IP address to connect to the gateway. In the Add-VpnS2SInterface replace the -Name parameter value with the name of your Network. In the Set-VpnS2Sinterface replace the -Name parameter value with the name of your Network. In both Set-PrivateProfileString locations replace the IP Address with the name of your Network. In the Connect-VpnS2SInterface replace the -Name parameter value with the name of your Network. You will want to run the entire script on your RRAS server. I have never been able to run the entire script at once successfully. I suggest running the top 69 lines to install the RRAS roles and features first then running the configuration lines of the script one at a time. Repeat the same process for the West network. 01/19/2015 Removed section on creating Affinity Groups, and added information on why they are not needed any longer. 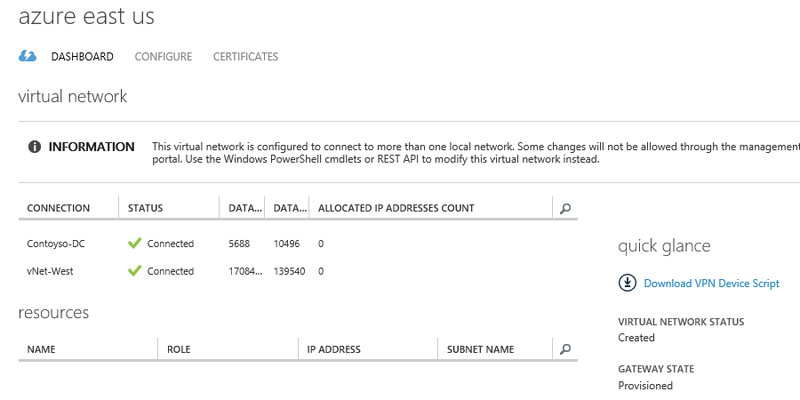 Also added the information for inputting the on-premises DNS information.